All right – I’ve let this book settle for a few days, and I’m still not sure if I’m disappointed or relieved by its outcome. Many thanks to Recorded Books for sending this title. 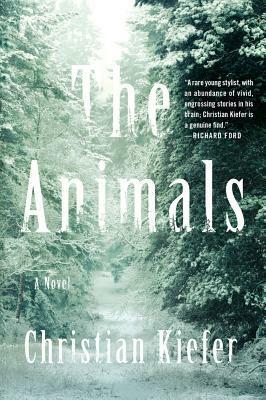 The Animals is a quiet and fascinating novel written by author Christian Kiefer, and the audiobook is expertly narrated by Richard Poe. This was my first novel by Christian Kiefer, and I was immediately struck by the eloquence of his writing. It takes a strong hand to share a tale that’s both dark and beautiful. I had no expectations going in, but once Bill Reed took up space in my mind, I became enthralled with his story. The Animals follows the daily life of Bill Reed, a seemingly mild mannered man who runs a wildlife sanctuary in rural Idaho. Bill is completely devoted to the animals that are in his care, from Majer the bear to injured raptors and a skittish wolf. His sanctuary is exactly that, as the creatures would not be able to survive on their own in the wild. Bill is the guy they call when there’s an injured deer at the side of the road. He’s the person they reach out to when a wild animal is found hurt, alarmed, or abandoned. People know that Bill will take care of the situation, no matter what needs to be done. Bill’s girlfriend, the town’s local veterinarian, adores him. Her small son does as well, and it’s only a matter of time before sweet Bill Reed pops the question. The local authorities respect Bill, and take up his cause when the gaming and wildlife people prod too much into the fact that he has wild animals in pens. Life seems fulfilled for Bill and his animal entourage, which gives readers the fleeting chance to settle in and simply gaze at the author’s impeccable imagery. You know, however, that while the masterful imagery will remain, the sweet solitude can’t possibly last. There are hints here and there that Bill had a troubled past. The novel alternates between the present and the past, and the story slowly hands you puzzle pieces, one by one. When news comes that Bill’s childhood friend Rick has just been released from prison, Bill’s character jolts from mild mannered to distressed. Was Bill involved in the activities that led to his friend’s arrest? When Rick, a most unwelcome thorn, manages to insert himself back into Bill’s life, the story starts to take a dire turn. The snapshots from the past get darker. Present day Bill just wants Rick to leave him alone. To what extent is Bill’s way of life threatened? Is anyone safe? What happened all those years ago? Who is in danger? It’s easy to rally around Bill and his loved ones. It’s also easy to wish away the past. Can people change? This book grapples with the long journey from troubled to redemption. And while I was smitten with Bill’s charm and his open heart, I eventually became concerned by my understanding of Rick. On more than one occasion, I wondered if I was rooting for the wrong person. My indecision wound up being a character in the novel, and I have to confess that this was terribly distracting. In a good way. For me, the success of The Animals was not just in the story itself, but in the challenge that it presented. I wasn’t just invited to question the moral authority of the protagonist. I was provoked. And while I never stopped liking Bill, I did wish that he had made different choices throughout his life. His was a complex and flawed character, and the irony of his decisions could keep any book club busy for hours. In addition to a smart plot, this novel’s strength is its prose. The wilderness leaps from the tale in bold description, and when Bill leans in to pat Majer on the head, you can feel the old bear’s fur. The author’s use of pathetic fallacy is key in setting the tone, and I appreciated every descriptive word. Let’s not forget the animals, with their dependency and their faultless natures. As the novel continues, their characters become increasingly important, and you’ll love every one of them. They were Bill’s salvation, and the book’s beating heart. Overall, the characters of this book are raw and very real. There isn’t an ounce of melodrama. The emotion you’ll feel as a reader will be thanks to a clever story line, not cheap manipulation. As narrator of this audiobook, the gravelly intonations of Richard Poe were sheer perfection. He was Bill just as much as he was Rick. He breathed life into every character. It was a 5-star performance. Overall, while this type of novel isn’t a typical read for me, I have now joined the group of admirers who love the work of Christian Kiefer. He won’t pull any punches, but he will leave you with something to think about. 4.5 stars for The Animals. I’ve got this book on hold at the library – so glad you liked it! Thanks for reading/listening. I was so happy when I heard Richard Poe was going to read it. That guy is a master narrator. His reading of East of Eden remains my favorite audiobook of all time. Richard Poe also narrates a bunch of Richard Ford’s works, including the new one, Let Me Be Frank With You. That’s not nuts – that’s fantastic news! Might it be released next year? (No pressure, of course – I can be patient.) Can’t wait to hear more about it – please keep us posted. I was also thrilled to find the East of Eden audiobook pretty quickly – thanks again! God only knows when the new one will be done. I’m trying to prune some of the excess out (harder than I thought) and have at least 200 pages to write until it’s actually done. I thought I’d have a full draft done by summer’s end but I blinked and summer’s over. Will be done by end of year, I hope, and that means 2017 release at the earliest (at least that’s my guess–and this is assuming my editor likes it enough to publish it at all! ).